Main Street Markham, the home to many great stores, historic sites, wonderful people, and now, the noble Canada Goose. Visit Main Street Markham and explore its many excellent stores and services. Here you’ll find the best breakfast and dessert, the best butcher, best travel agent, best jeweller, gift store and best antiques, the best financial planner, best bicycle shop, best Kitchen & Bath store, best formal wear, shoe shop, and more! 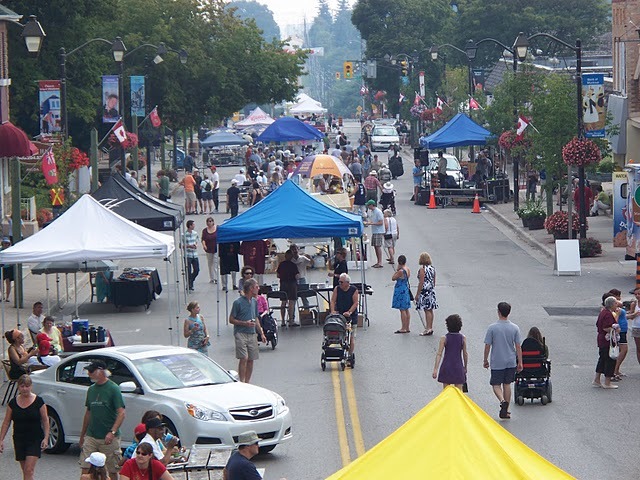 Also, don’t miss Main Street Markham’s amazing annual events and festivals. Art in the Parkette is every Saturday beginning in June, so don’t miss your chance to get your work noticed, or to explore the marvelous pieces of others. The Main Street Markham Farmer’s Market every Saturday during the spring, summer and early fall has wonderful locally grown produce and homemade treats. For homemade desserts, fresh produce, great music and a barbeque, the Farmer’s Market is every Saturday until October.